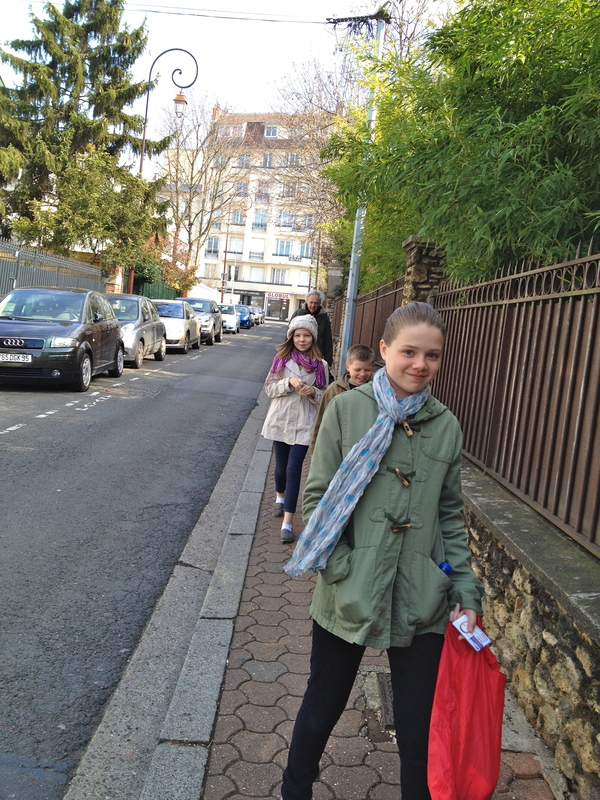 DAY FOUR – Grands visit Paris!! – CREPE PLACE NEXT DOOR!! (Ian & B’s dinner out) -CAFE CONSTANT-139 RUE ST DOMINIQUE- While they’re at HOTEL on Poncaire they could take:– Bus 82 dir of Neuilly – goes around Eiffle Tower in TROCODERO – & Poncaire,Iena stops etc – Lovely views upclose with the bus and they already have the navigo for it. Relaxing morning- then headed out to VERSAILLES on the RER-C- Papa’O went there to teach his class and left us at the Cafe. While drinking expressos and snacking I picked up our tour tickets next door at Tourist Information for private tour. Headed back from the LAKE – to the front of Versailles to meet guide – – again no lines SO – pays to come to Paris EARLY in the springtime as the 17,000 visitors a day isn’t something to relish and the lines to each room are very long! She said sometimes over one hour to move through those rooms. No thanks. There were a lot of other tours going on in other languages, but just our family went through as our own group! Guide was French and she was knowledgeable. It moved fast & was a great tour. We met Papa’O afterwards at the station and headed back on the train. Ian & B left us at RER Eiffel where they went to their hotel and for their special dinner at CAFE CONSTANT on Rue Dominque. 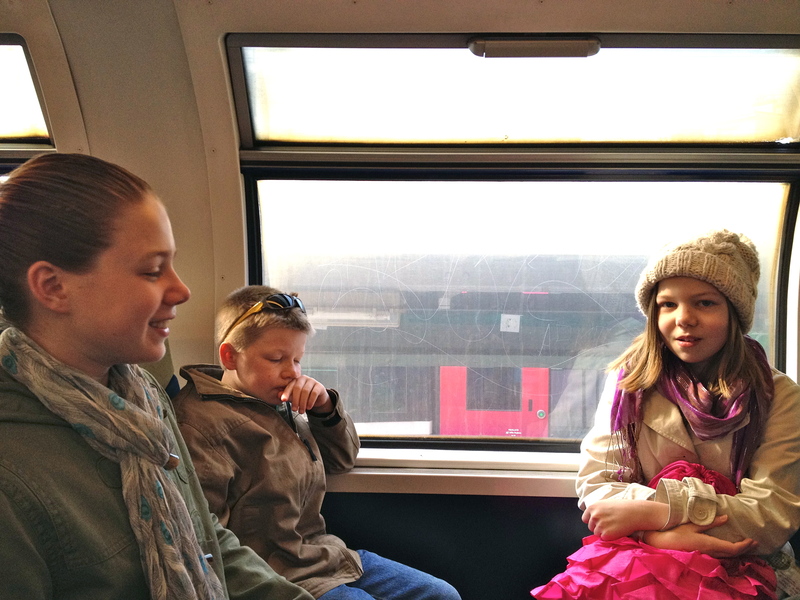 We stayed on the train for the trip back home and for dinner. (Picardi’s famous 4 cheese pizza with salad!!) Dessert cookies – Kids and I thought up more fun questions for the French/Am family – for tomorrow’s game! CAFE CONSTANT was a “private occasion” thus, I have no pictures. But make no mistake about it – Cafe Constant is a great place for a French Dinner that won’t entirely break the bank! Also, Chef Constant came out and introduced himself, so that was a HUGE HUGE deal!!! BUTTES CHAMONT PARK – around 4:30 – to see my friend’s apartment in the 19th – meet my friends – a French/Amer couple, see the cutest baby ever and have real BRITTANY CREPES !!! YOU BET WE ARE!!!!! IT’S P A R I S Baby !!!!! ← DAY THREE – Grands Visit Paris!! This is your husband….great pictures, wish I had been there!